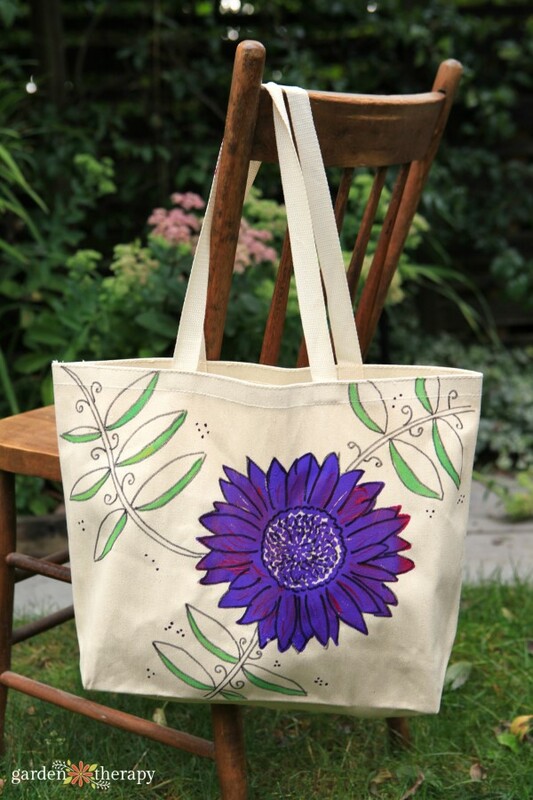 Market bag, lunch bag, knitting bag, beach bag, travel bag—it doesn’t matter what you decide to use this hand-painted canvas bag for because no matter what you choose, it’s a gorgeous way to replace single use plastic bags with artistic flare. 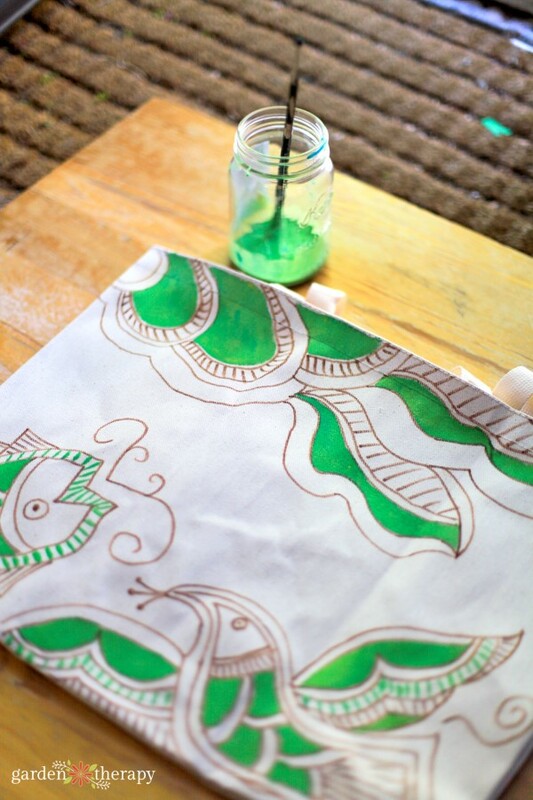 This project will show you some simple ways to brighten up reusable market bags with brilliant colour and permanent paint. 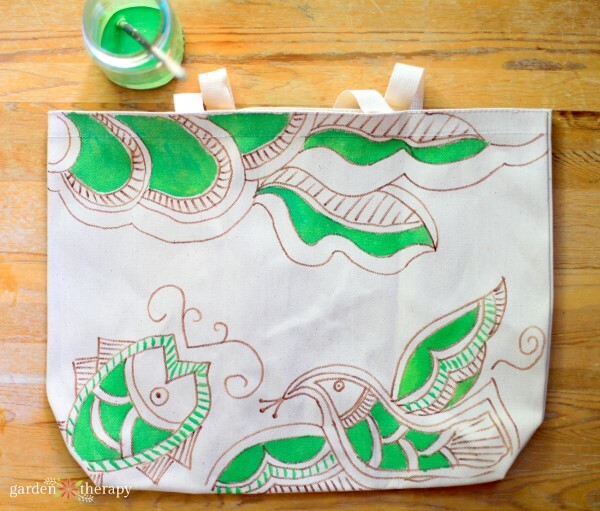 Since these bags are meant to be used, and reused, the fabric paint is washable. Setting the paint using high heat will ensure that the design you create will keep on blooming even if you use it every day. I know you already know about the giant garbage island in the middle of the ocean. Perhaps you also live in one of those fabulous cities that have banned single-use plastic bags from grocery stores. Either way, I hope that, like me, you have a bunch of reusable grocery bags that you take with you when you go shopping or to the market. 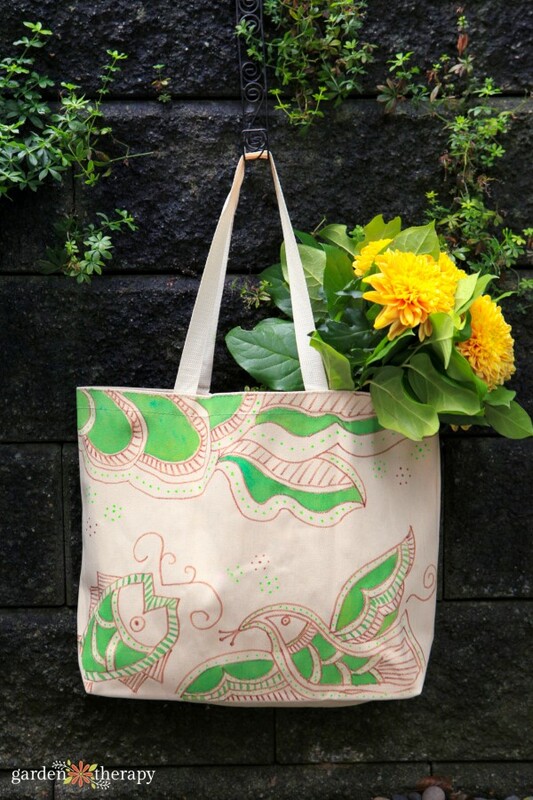 BUT, the one thing that nobody is talking about that reusable shopping bags don’t have to be ugly! Sure, you probably have a favorite bag that’s the exact right size and shape for your needs. It’s probably got some company logo on it that doesn’t really mean anything to you. Yeah, I’ve got that bag too. Here’s the thing: when I pull out hand-painted bag politely say to the cashier, “No thanks, I’ve got my own bag.” I’m inevitably greeted with a smile and a warm compliment about how pretty it is. It might not seem like it’s something that’s very important in the grand scheme of things, but frankly if my brightly-colored painted flowers can make someone smile then maybe it does make an impact. 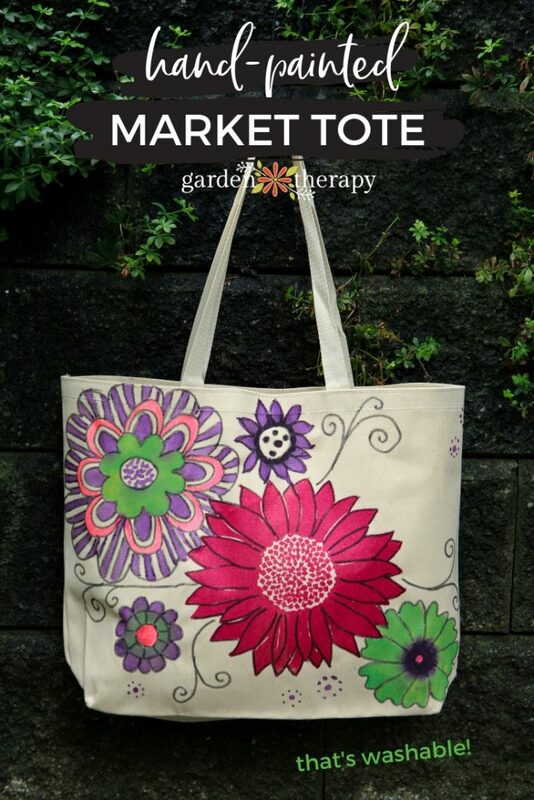 Painting my own market totes is sure is a lot of fun too. There’s a whole host of studies and articles on the positive impact crafting has on mental health. Activities such as knitting, basket weaving, crochet, ceramics, needlework, woodwork, and gardening (of course) have been used by occupational therapists to help both with taking the mind off pain and negative thoughts as well as stimulating focus and calm. Beyond all the studies, I just know how I feel when I’m making things. It’s where the creative part of my mind gets to take over and the other parts can go have a nap. 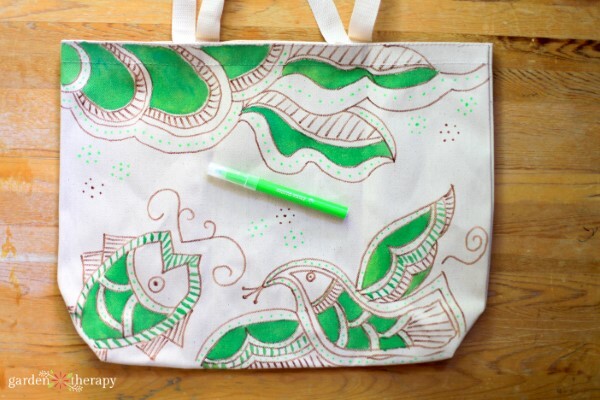 Painting canvas bags is a simple, rainy day project that anyone can do. You can paint your canvas freehand or copy a design. A stencil can help layout the design for you. 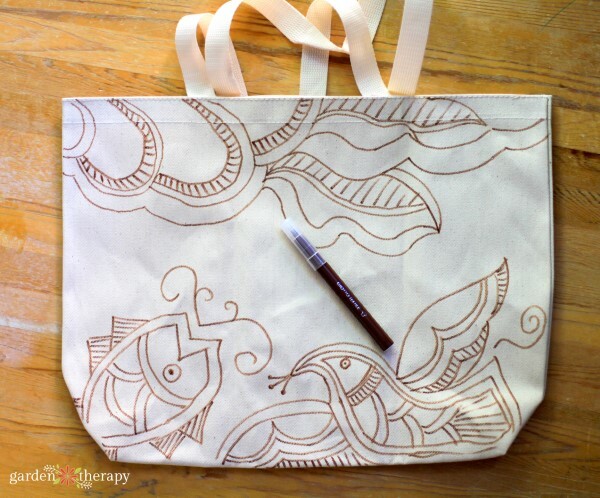 Or you can simply block off sections of the bag with tape and paint the shapes in between! 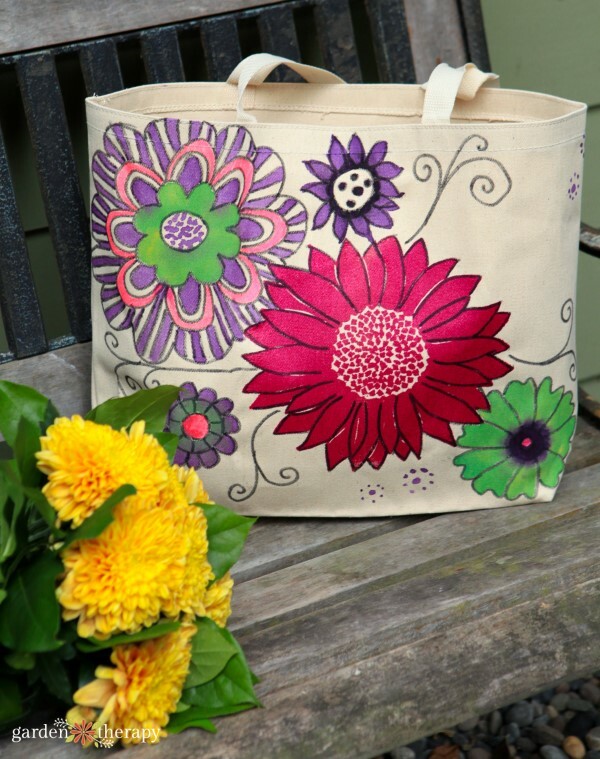 Using fabric pens and fabric paint means that your bag can be used, washed, dried, and used again without any fading to the design. Fabric paints are specifically designed for painting on fabric. These paints are meant to be heat set so that the fabric can be washed and dried without the paint fading. There are both opaque and translucent paints available. Opaque paint will cover any color of fabric or other (dry) paint. Use light-colored opaque paints on dark fabrics, or dark opaque paints on light fabric for high contrast designs. Translucent paint will allow you to see some of the paint or fabric underneath. Translucent paint can be nice when doing a tone-on-tone design, layering colors, or an ombre pattern. There are a few different ways you can create your images: freehand, stencil, or masking. Freehand drawing allows you to have a complete creative license with the design that you have chosen. Swirly lines, animals and birds, leaves, and botanical elements all have flare when created by hand. If freehand is not your style, you can use a variety of different stencils. Use letter stencils to spell out a word or phrase. Or choose a stencil of an object you would like to paint. Masking is to block off part of the canvas to create a guide for the paint. Use pieces of masking tape to create shapes on the canvas and paint in between with different colors to create a modern, graphic design. For all of my designs, I start with a freehand design using a fabric pen. You can look for inspiration online, in nature, or in a adult colouring book. Next, use fabric paints to fill in parts of the design. You an always switch back to the fabric pens again to add more detail. Once the paint is dry, set them with an iron or a heat press. Use the hottest setting and iron each part of the design for 10 minutes. I will admit, that 10 minutes of ironing seems like an eternity. Since I make a lot of fabric painted or iron on vinyl projects, I got a Cricut EasyPress as a Christmas gift last year and it makes the whole ironing part a whole lot easier. The large base and high heat allows you to set the pain in just 30 seconds! Either way, take the time to properly set the design. This will ensure that you can wash the canvas bag according to the directions on the fabric paint and your creation will stay beautiful! Make yourself a few extra bags so you can wrap presents with them as gifts this year as well. You could also fill them with groceries and bring them to some new parents or an ailing friend. Any way you use them, they will brighten up someone’s day!